Pulaski Senior High School Principal Jay Altobello, center, presented Leonardo Marino, left, and Annamarie Forestiere with a “Letter of Commendation” from the National Merit Scholarship Corporation. National Merit Scholarship Corporation Commended students Leonardo Marino and Annamarie Forestiere with Pulaski High School Principal Jay Altobello. 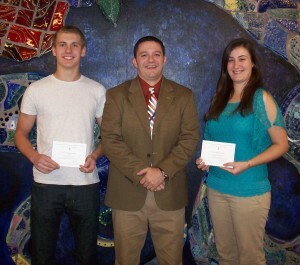 As commended students, both Leonardo and Annamarie are recognized for placing among the top five percent of more than 1.5 million students who entered the 2014 National Merit Scholarship Competition by taking the 2012 Preliminary SAT/National Merit Scholarship Qualifying Test during the fall of their junior year. The NMSC used the scores from the critical reading, mathematics, and writing skills, to determine the top high-scoring participants who qualified for program recognition.